I have gotten requests for information on the best ways to carry handguns for both men and women. Let me begin by saying we come in different shapes and sizes. This is never a one size fits all solution. We have what we have and must work with it. I want to advise women against carrying firearms in purses. You may inadvertently arm a purse snatcher and too often women put their purses too close to children. There are great handbags for guns made by Galco Gunleather. They can be also locked if needed but it defeats the purpose of having a gun ready for immediate use. If you’re going to carry a gun in a purse I say use a Galco product with a shoulder strap. Keep the purse very close on your weak side of your body. It can work as a De facto shoulder holster if kept strictly under control. Galco handbags are as fashionable as you can find anywhere in the world. They are also better made than those by designers known for quality. For well-fed men and women there are lots of options. Shoulder holsters can be great for men and women wearing jackets or opaque outer shirts and sweaters. It depends on the size of the gun and your upper body configuration. Belt holsters can stick out through clothing like a red flag. There are low profile holsters that keep the guns close. I’d avoid gimmicky holsters like the ones hiding behind phony pagers and such. There are belly band style holsters. I like those that are made from elastic and nylon material to wear under shirts or other tops. They should be worn over a t-shirt (or camisole for women) to keep the gun away from your skin and body salt. There is also the issue of comfort. Ankle holsters for the most part are uncomfortable and should be avoided by anyone who does a lot of walking and running. They are fine for someone working in a retail establishment in confined areas. You are limited by size to what you can conceal on an ankle. Boots and guns don’t mix well unless you’re into pain. You must remember tha is very difficult to run and draw a gun from an ankle holster. Mexican carry is a real option. That means no holster. This works for larger guns provided you wear a strong and tight belt so you gun does not slide down your pants. This is also over a t-shirt at the minimum. Don’t try this with guns such as the Glock with its sensitive trigger because it’s downright dangerous. There are only a few holster companies that make decent and safe products. They should design holsters your safety in mind. Sometimes you will find a very usable holster for your gun somewhere but be careful because some holsters can be more like booby traps when their safety snaps inadvertently move the safety levers of semi-auto pistols to the fire position. 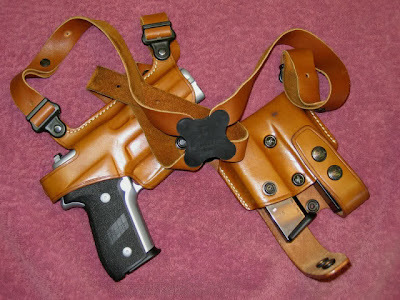 The flagship holsters are made by Galco Gunleather. I’ve been using Galco products for forty years and they are the best found anywhere. They insist upon perfection and their research and development with their products is exceptional. Let concealment work for you by keeping surprise on your side. Don’t tell business associates and friends that you carry a gun because in an emergency they may “out” you and put you at a disadvantage. You can avoid explanations about why you chose to carry a gun. You will also spare those irrational people you know from going into hyper-ventilation over your choice to stay protected. Always carry as large a caliber gun as you possibly can. If you need it even a .45 ACP gun seems inadequate especially if you have more than one assailant to deal with. The Galco Gunleather website is here. Check out the "Belly Holster". It's a soft comfortable elastic type material worn around the belly with a pocket for a small or midsized handgun. Great concealment. Paul, I strongly suggest you and your fellow bloggers consider carrying a weapon AIWB or Appendix Inside the Waistband. I've been carrying that way for about 13 months now and can tell you that this is the way to go. It's faster, more comfortable and much more concealable than any other method of carry provided you have a cover garment on. Some of the better companies that make AIWB holsters are Custom Carry Concepts and Garrity Leathers. CCW makes their holsters in Kydex and will put a leather backing on the exterior of the holster where it meets your skin which increases comfort. It makes for a very rigid holster that remains open even after you draw which of course is important when you re-holster. Garrity makes an OUTSTANDING leather holster which is also designed for AIWB carry. As I said, AIWB is an outrstanding method of concealed carry. I suggest you and your bloggers give it a try. Once you try it, I think that you, as I, will never go back to any other method of carry.